I am back with a new post today and a new layout share. I haven't been able to scrapbook or paper craft for the last couple of months (busy with a little baby boy), but last week I finally pulled myself together and finished 3 layouts. Today I will show you the first one I made. 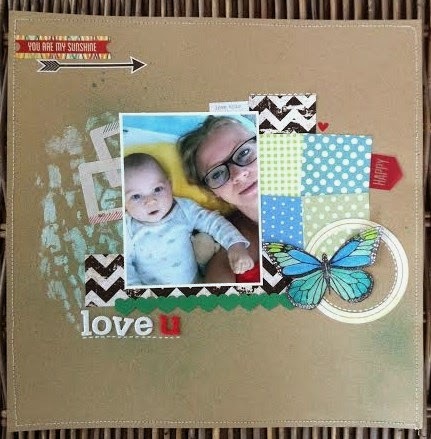 I found this adorable picture of me and my son and decided to make a cute scrapbook page. The base paper is just a regular craft sheet that I sewed around the edge to give a little bit of definision, I have used a 6x6 mask template from TCW called "Little Letters Collage" and masked it with some white paint. It didnt turn out exactly how I wanted, but I decided to keep it that way. For the patterned paper I have used a A4 pad that doesnt even have a name, but there are cute polka dots and grid patterns in it. The butterfly stamp comes from CraftEmotions and it's called "Botanical2". I colored the butterfly with my watercolor pencils and fussy cut it. For the embelishments I used two die-cut collections- Pinkpaislee "Cottage Farms" and BasicGrey "Mint Julep". I also used the Simple Stories "24/seven" arrow sticker in the corner, as well as a cute laber from "Memo" by My Minds Eye. I spayed the layout with my "Bahama Blue"glimmer mist. I enjoyed making this layout and I am happy how it turned out.